Here's one cool thing that's made its way from sci-fi movies into everyday reality: making phone calls from your watch. In fact, lifting up your wrist to speak to someone else is relatively simple now, and you can now do it if you own certain Wear OS smartwatches. 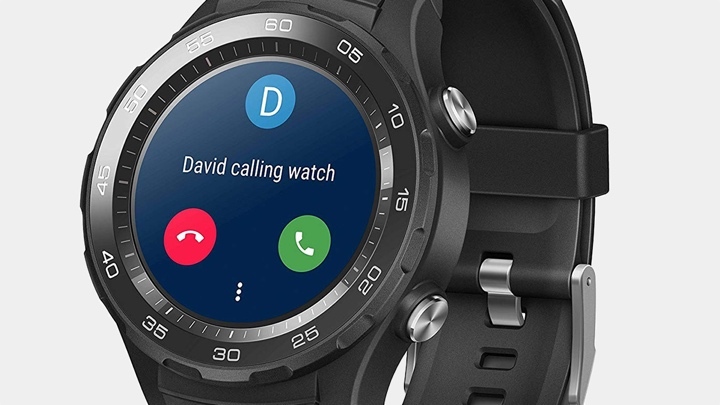 We say certain watches because a small number of Wear OS devices including the Huawei Watch 2 - offer a 4G LTE variant with room for a SIM card, enabling you to place calls without any phone nearby. For the most part though, the way you make and receive calls is going to be the same across the board. Here's how you do it. To be able to see your contacts on your Wear smartwatch and place calls to them, you need to have synced across your Google account information. This should have been taken care of when you initially set up your watch, but you can do it afterwards too. Open up the Wear OS app on your Android phone, scroll down to the bottom of the screen, then tap Advanced settings and Accounts. Toggle accounts on and off here, and add new ones if you have more than one account. Make sure the toggle switch is on for the account you want to use contacts from. Tap Settings from the app list, then Personalisation and Accounts. You can add accounts from here or remove ones you've already set up. Open up the list of apps on your phone, choose Contacts, and you can see everyone in the phone book attached to your Google account. A quick swipe up or down the screen is one way of going through this list, or you can use the search button at the top. The search button gives you two options: voice or keyboard. Both have their advantages, with the keyboard a more precise way of searching and the voice search easier to use, so it really depends how complicated a name you're looking for. Tap on any contact to see the different ways you can get in touch with them—this should include calling and texting, as well as maybe other app options like WhatsApp. Tap on the star icon at the bottom of a contact page to add them to your favourites. Once you've got a contact up on screen, making a call is as easy as tapping the call button next to the phone number you want to reach them on. Make sure your smartphone is nearby, as the Wear OS watch will use its cellular connection to make the call. Alternatively, find the Phone app on your Wear OS smartwatch apps list and use this to access your contacts. You get a dial pad here too, so you can tap out a number if it's not already stored in your contacts list. If a call comes into your phone, it automatically appears on your Wear OS smartwatch, together with buttons for accepting or rejecting the call—if you want to talk, choose accept (the green button). If you don't want to pick up, tap decline (the red button). At the bottom is a menu (the three dots) that lets you send preset messages to your contact (saying you can't talk now and so on). This might be a better option than just sending someone to voicemail. During calls you've got more options—swipe up on the call screen to access the dial pad (for inputting numbers), as well as options for pausing the call, muting the call, or adjusting the volume of the audio. If you find it easier you can use Google Assistant to place calls: bring up the Assistant (with a button press or "hey Google"), then say "make a phone call" and the contact you want to speak to. If Wear OS finds several contact matches, you can pick between them on screen. By default, the call audio still goes through your phone, even if you've made or received the call from your watch. Not all Wear OS watches have microphones and speakers, and they usually won't be as good as the ones on your smartphone anyway. You can use your smartwatch like a Bluetooth headset though. From Settings on the Wear OS watch, tap Connectivity then Bluetooth, and enable Play phone voice call on watch. This will route the audio through your watch instead (if the option doesn't appear, it's not available on your wearable). Making a call on a 4G LTE enabled phone is almost exactly the same as it is on any other Wear OS watch, with the obvious difference that you don't need your phone nearby. With your contacts synced, you can place calls through the Contacts app or Google Assistant. Not sure if you have a cellular watch? Head to Settings then tap Connectivity: If a Cellular option doesn't show up here, you'll have to rely on Bluetooth like everyone else. If your watch does have the option, tap it to configure the connection. As with any smartphone, you need to have enough signal to be able to make a call. Swipe down from the top of the screen from the watch face and check the Signal reading to make sure you're hooked up to your network for calls.